Polyurethane's pour and debridge systems are formulated for these exacting applications, and according to the manufacturer Azon, offer up to four times more shear strength than that of polyamide. The three-step pour and debridge process, which includes a mechanical lock by either the Azo-Brader or Lancer method, results in an energy-saving window frame with the advantage of long-term durability that is warranted from structural deterioration. An aluminum profile is designed and extruded with a strategically placed cavity to limit the bridge of metal that acts as a conductor of hot or cold temperatures on the exposed surface. The cavity surface is conditioned with a lanced, mechanical lock prior to the application of the liquid polyurethane polymer into the channel. The insulating two-part polyurethane solidifies into a very strong, low conductance structural polymer. And finally, the third and final step in the thermal barrier process—is the removal of the metal bridge from the bottom of the channel creating an aluminum-polymer composite with high shear strength capable of withstanding strains and forces in extreme weathering conditions. Design. An aluminum window profile is designed and extruded with a strategically placed channel to encapsulate the Azon insulating polymer. The channel surface can be conditioned using the patented Azon Azo-Brader™ by abrading the profile to mechanically lock the polyurethane polymer with the finished surface of the aluminum profile. Pour. Utilizing the Azon Fillameter™ equipment, two-component polyurethane is dispensed as a liquid into the thermal barrier channel. Within minutes, the thermal core, consisting of a reactive resin and a polymeric isocyanate, react and solidify quickly into a very strong, structural and insulating polymer. Debridge. Extrusions are transported to the Azon Bridgemill™ for the third step in the process, removal of the metal bridge from the bottom of the channel to produce a true, non metal-to-metal structural thermal barrier. Linetec also has skip debridging and double debridging capabilities. Skip debridge leaves a small aluminum bridge remaining across the thermal cavity. This enhances structural integrity but does sacrifice some thermal performance. Typically one inch of aluminum bridge remains every foot along the extrusion. Other ratios can be specified. Double debridge is often required to minimize extrusion costs. It is also available for double fill cavities when increased structural strength and stability is required. Energy costs rank among the top concerns for building owners and managers, while comfort and indoor temperature control head occupants' top concerns. Read Linetec's article on improving the thermal performance and influencing long-term savings on the life of your building. Azon thermal pour and debridge offers tremendous performance, protecting against temperatures of -100C (-148F). Extreme cold, nor hot temperatures, will transfer through an aluminum frame with pour and debridge thermal barrier. The Azon pour and debridge method is suitable for withstanding the most demanding climates and conditions with the highest performance in impact resistance, sheer strength and heat distortion. Optimizing thermal performance contributes to energy efficiency and helps reduce associated heating and cooling costs. As an approved applicator, Linetec and Azon follow the guidelines set forth in the AAMA QAG-1-98 specification, Quality Assurance Processing Guide for Pour and Debridged Polyurethane Thermal Barriers. 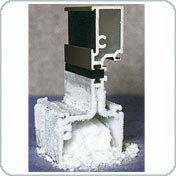 The Azo-Brader™ mechanical lock system improves the adhesion between the polyurethane polymer and the surface of the thermal barrier pocket in the aluminum window extrusion. As an Aproved Azo-Brader™ Applicator, Linetec must adhere to strict quality control procedures and testing. This allows us to pass through the Azon 10-year warranty against failure of the thermal barrier polymer due to dry shrinkage and fracturing. Dry shrinkage refers to a condition when thermal breaks shrink as they age, opening corners to leakage. The Azon Lancer™ provides mechanical surface conditioning of the aluminum extrusion cavity to ensure maximum adhesion of the thermal barrier polymer to durable architectural finishes. The Lancer™ mechanically locks the structural polymer into the thermal barrier cavity by creating lanced, inward curving aluminum lug projections in a staggered formation along the thermal barrier cavity in the aluminum extrusion prior to the pour and debridge process. The Lancer is fast, quiet and works inline with machinery to save floor space and enable easy setups, and will accommodate many common open-top thermal barrier extrusion profiles. Windows, storefronts and doors produced with the Azon Lancer™, the structural polymer system and Azon E-Quality Audit™ procedures, as outlined in the warranty agreement and quality assurance guide, carry a ten-year warranty against window failure caused by defects in the thermal barrier. Aluminum is a highly thermal conductive material that will rapidly transfer exterior climatic temperature unless something is done to stop the thermal conduction. A thermal barrier system will improve thermal performance while maintaining the structural and long-term durability of the fenestration unit. Customers that choose Linetec, can rely on our thermal barrier service to ensure optimal performance of the thermal barrier. Thermal insulating strut can contribute to earning performance points toward LEED® Certification, the Green Building Rating System. Achieving increasing levels of energy performance above the prerequisite standard to reduce environmental impacts associated with excessive energy use. Provide for a comfortable thermal environment that supports the productivity and well-being of the building occupants. Copyright © 1996–2019 AECinfo.com  Product presentation: information, news and documentation about Thermal Improvement – Pour & Debridge and Thermal Strut.